What is Image SXM? | How can I get hold of a copy? | What are the different versions? If users would like to see more file formats supported, then I am open to suggestions. The need for software that can be customised to handle scanning microscopy images has been outlined in an article that I have written for the Royal Microscopical Society, entitled Software For Scanning Microscopy. It describes software packages that are available and outlines some of the customised features of Image SXM. How can I get hold of a copy? Email me if you have a problem getting hold of a copy. What are the different versions? The current version is the Intel (X) version. If you want any of the older versions, go to the Installer archive page. If your Mac is more than a few years old and it is not clear to you which version you need, click here. The SXM-related features are described by a set of on-line help pages that give a brief description of each of the new menu items and some guidance concerning the use of PC Exchange/File Exchange and FTP file transfer of image files (for those using a Mac to look at images produced by a PC or Unix workstation). Also, these new menus support Balloon Help or Help Tags. If the Help pages don't answer your question, try the FAQs page. If you use Image SXM, then please use the 'User Feedback' form (in the Help menu) to feed back to me information about who you are, where you are, the SXM system that you use, and the Mac on which you run Image SXM. This feedback will help me in the development of future versions. 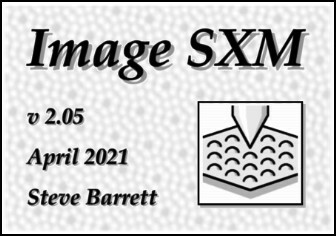 To keep up to date with news of the latest version of Image SXM, check the page ImageSXM.LatestNews once in a while. For documentation on using Image SXM for specialist medical applications, see the MIASMA web page. For documentation on using Image SXM for crystallographic orientation imaging, see the PrinCIPia web page. I have recorded talks on the basics of image analysis and tutorials on using Image SXM. If you have problems, or any comments or suggestions for new features that you would like to see in future versions of Image SXM, then please email me.